The holiday countdown is on, which means deep-fried turkey, mashed potato pools, carbs à la mode and post-meal napping is soon to be a reality. And embrace it we shall. From Pecan Pie Bars and Cheesecake Brownie Bites to Pumpkin Whoopie Pies and Secret Ingredient Chocolate Chip Cookies, I am all for a freshly baked dessert around the holidays. But with the oven on overdrive, it’s often helpful to have a no-bake dessert ace up your sleeve when it comes to feeding hordes of holiday guests. 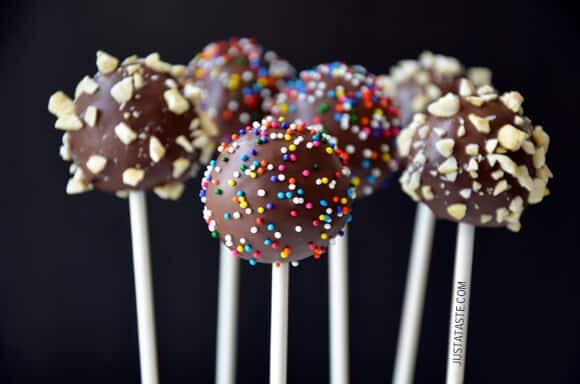 No-Bake Chocolate Cookie Pops are the quick, easy, kid-friendly answer to your “there’s no room in the oven” conundrum. 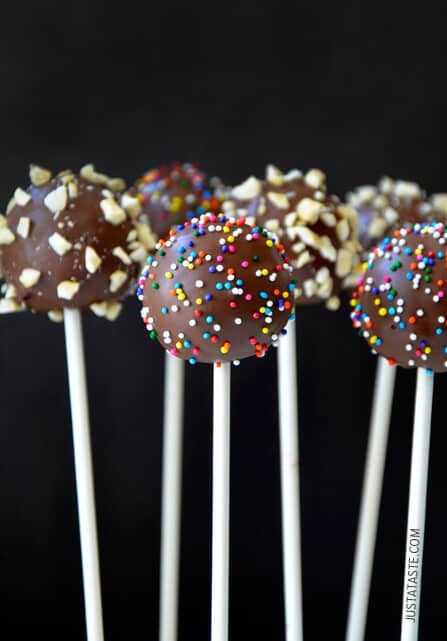 These festive pops are the confectionery cousin to cake pops and are made with just three ingredients. Decorate them with your choice of sprinkles, chopped nuts, toasted coconut or crushed pretzels and then put them on display by sticking them in tall glasses full of fresh cranberries and walnuts. Keep the pops kid-friendly, or add an adult twist with a splash of Grand Marnier. Because nothing says “happy holidays” quite like booze-infused chocolate cookies on a stick. 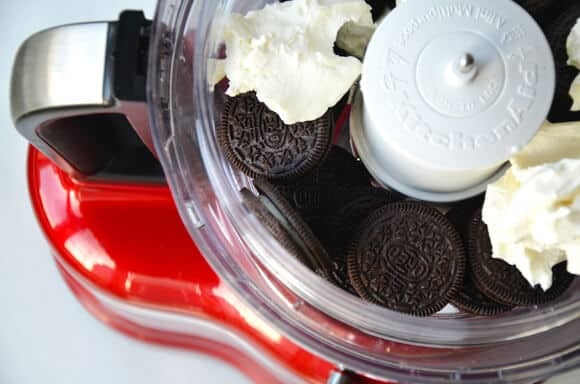 Place the cookies in the bowl of a food processor and pulse them until roughly chopped. Add the cream cheese and continue pulsing until the mixture is well combined and there are no large pieces of cookie remaining. Line a baking sheet with parchment paper. Using your hands, squeeze and roll the cookie mixture into 1-inch balls. 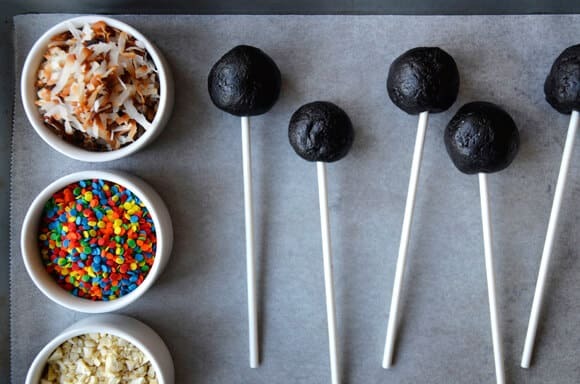 Insert a lollipop stick into each ball, place them on the baking sheet and freeze them for 30 minutes. Melt the chocolate and vegetable oil in the microwave on 30-second intervals, stirring between each interval, until fully melted. Dip the cookie balls in the melted chocolate then immediately garnish them with sprinkles, crushed nuts or toasted coconut flakes. Return the pops to the baking sheet. Loosely cover and refrigerate them for 1 hour or until the chocolate is set. 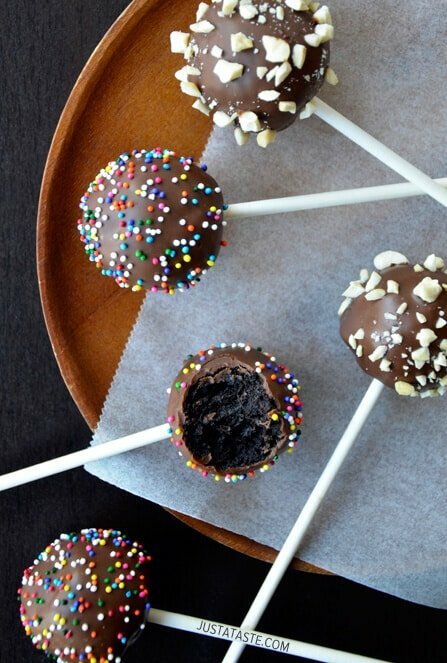 Turn these cookie pops into cookie truffles by serving them sans lollipop sticks.